Gary Gillis opened GGR Mould Remediation Services in 2008. The company’s primary services include removing mould from areas behind drywall, crawl spaces, floor joists and attics. Gary and his employee Gloria Young are Government certified in mould and asbestos removal and are trained to follow the Provincial guidelines for removal in a safe manner. In addition prior to coming to the Jubilee Fund for financial assistance, Gary had completed the Meyers Norris Penny Self-Employment Program. The Jubilee Fund was instrumental in helping Gary start his business. It guaranteed the loan for the purchase of tools and the special equipment needed to conduct their work. 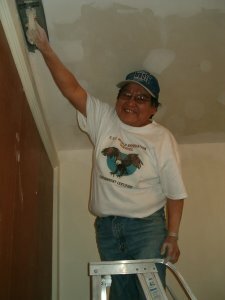 The Jubilee Fund visited with Gary and Gloria working on a house in Selkirk that had extensive mould damage. In speaking with Pat the home owner, she expressed how pleased she was with the quality of their work. They had safely removed and cleaned all the infected areas and were presently repairing the damage to the drywall and floors.